If you've read my posts before you'll be well aware that as a strong advocate for .brands and the power they have to revolutionise digital marketing effectiveness, I am always eager to share some love with organisations that have taken the leap and launched their .brand TLDs. In recent months we've seen diverse and exciting examples from BMW, the Australian Football League and CERN — just to name a notable few. I have the privilege of advising some of the world's largest companies on their .brand strategy, but one recurring question I hear is "When will we see .google and how will they use it?" Google Domains permanently moved to the .brand domain name www.domains.googleLast week, a significant instalment in that answer became apparent when Google Small Business announced on Twitter and Google+ that Google Domains had permanently moved to the .brand domain name www.domains.google as its primary digital location. This relatively new business stream is Google's attempt to take on companies like GoDaddy and Web.com in providing domain names, websites and associated services to SMEs and is a slick offering that blends in a range of other Google services. It is however not the first time they've used their .google extension, but is certainly the most prominent. We know Google has registered a small number of other domains under its .brand TLD, including the humorous 'www.com.google' which was used for an April Fools' Day prank last year where the page appeared in reverse as if the visitor was 'inside' the search engine looking out at the user. Note — that feature is no longer active and users typing in that address now are redirected to the standard search homepage. Additionally, Google launched www.registry.google as its Top-Level Domain information hub several months ago, but by its nature this site is unlikely to reach many beyond our industry. Its domain name Registrar however will receive significantly higher levels of traffic given its consumer focus, particularly when availability is opened beyond the US. Other domains created but not yet resolving include 'www.nest.google', clearly referring to Alphabet subsidiary and home automation producer Nest. The search giant has made a conscious decision about its .brand TLD here; deciding to publically launch and promote www.domains.google despite also owning www.google.domains. It is a great sign of things to come with many commenters already expressing interest in the likelihood of seeing www.maps.google, www.drive.google and the like in the future. From an alternate perspective, visitors to the domain design.google will find themselves redirected to domains.google.com which is the traditional web address for Google Design. Google has ticked all the best practice boxes in the transition, with the redirection of previous domain names to new addresses and selection of a familiar, intuitive naming structure for key activities such as the Google Domains initiatives. 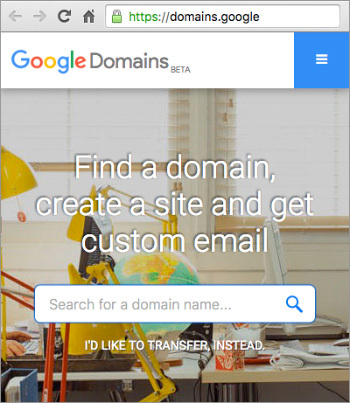 The launch of www.domains.google indicates a strategy forming around simple, utility-based domain names under its .google TLD, which reflect pre-existing third-level structures with the .com extension 'dropped' off the end. For example, www.domains.google was previously located at domains.google.com, which now redirects. Finally, the elephant in the room with this domain transition is the search factor. With Google dictating the world of search as its most dominant player and many of the domain name industry continually looking for updates on its treatment of new TLDs, the performance of .google and Google Registry's other TLDs will be an interesting case to watch. Local Time: Wednesday, April 24, 2019 09:01 PM PDT – Page Load: 0.3274 Sec.